"When the going gets weird," Hunter S. Thompson once wrote, "the weird turn pro." As we cast our gazes back at 2014, we can all agree the year had more than its share of utterly odd moments. Needless to say, we're all pros now. Remember that 260-foot crater that yawned open in Sibera for reasons unknown? In November, Russian scientists were close to discovering the cause, but so far the sinkhole hasn't divulged its secrets. Lest we forgot, French chain Quick was the first to the all-black burger party, with its 2012 "Darth Vader Burger." But somehow, 2014 became the Year of the Battling Black Burgers, creating a rivalry 'twixt different versions of a food item nobody asked for, or particularly wanted to eat in the first place, much less do it twice. Burger King Japan threw down the gauntlet with its "Kuro Burger," which featured a pitch-black bun and (hurkk) a slice of black cheese. Not to be outdone, McDonald's Japan answered the call to battle with a version of its own. What culinary oddity will capture the world's imagination (and squid ink-tinted nightmares) in 2015? And will America get a crack at it this time? Gotta be Google Glass, the polarizing accessory of our times. A man was diagnosed with Internet Addiction Disorder after being deprived of his Google Glass. He had been exhibiting classic withdrawal symptoms, and often dreamed he was wearing it, which is problematic on both psychological and fashion-conscious levels. This one's not so "weird" as it is just plain adorable ... and admirable. After a jaw-dropping 90 rounds, a champion was crowned in the most epic spelling bee ever held in Jackson County, Mo., and possibly the world. The winning word was "definition," spelled correctly by seventh-grader Kush Sharma after the runner-up, fifth grader Sophia Hoffman, faltered on "stifling." It should be noted that these kids were so badass they cycled through all of the competition's available words, necessitating a two-week bee break while officials compiled an additional list. Slow clap. Via Mental Floss. 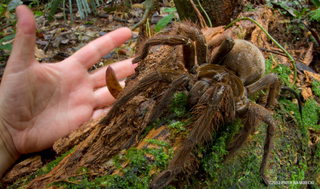 We'll always have a fond spot in our hearts and a vivid place in our nightmares for the Spirit Arachnid of 2014, the "Puppy Sized Spider." But the story didn't end there, because the Harvard entomologist who discovered it, Piotr Naskrecki, received death threats after collecting the specimen (i.e., killing the spider for scientific purposes) and placing it in a museum. Had to be Zack "Danger" Brown's joke campaign to fund his attempt at making potato salad. His goal was $10; he raised over $55,000. No viral-celebrity diva, the Ohio man used his windfall to fund PotatoStock 2014, a public party in downtown Columbus promising "peace, love, and potato salad." He has also donated some of the money to organizations that fight hunger and homelessness. Thanks to camera traps, we got some new intel on what wild animals are doing when they're not being watched. Turns out they're up to some really strange stuff. A mongoose-like genet was caught hitchhiking on the backs of at least two different species of animals, including the buffalo pictured above. An Indian teenager had 232 teeth removed from his mouth, the result of what doctors called "a complex composite odontoma, where a single gum forms lots of teeth." Lots and lots of teeth. Fortunately, the young patient pulled through the surgery, and can now look forward to going through life with just 28 choppers. The internet, however, will always have that truly distressing photo of his discarded tooth nubbins. Physicians in the UK were shocked to discover that a tape worm had burrowed its way from one side of a man's brain to the other. 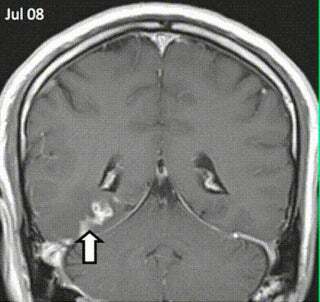 The 50-year-old patient had been complaining of headaches, memory flashbacks, and experiencing strange smells. The fact that the centimeter-long parasite was captured cruising around via brain scans (and then compiled into gif form) makes this story even more terror-inducing. BBC filmmakers caught unprecedented images of a giant red leech sucking up a worm like it was spaghetti — and we really wish they hadn't. Look at that thing! Recoil in horror, yet realize there's no absolutely no way you can tear your eyes away! How is 2015 gonna top that?